Birmingham continues to be an affordable place to live. 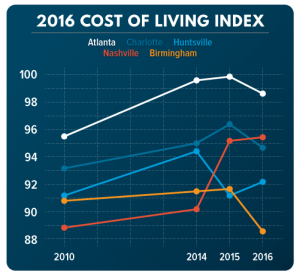 New scores from the 2016 Cost of Living Index showed Birmingham’s annual average cost of living score decreased over the previous year – from 91.7 in 2015 to 88.5 in 2016 (a lower score = lower cost of living; a score of 100 = national average) – and outpaced many of its peer cities. Birmingham’s lower score is reflected in several of the accolades the region has received over the past two years: Zillow has named Birmingham a top 10 market for first time home buyers two years in a row; Bloomberg Business reported that Birmingham was one of six metros where millennials can pay rent; and Forbes named Birmingham the most affordable city in the country for 2015. The index, which is compiled by the Council for Community and Economic Research, showed that Birmingham beat out quite a few of its peer cities in cost of living. Nashville scored at 95.5, Atlanta had 98.7, Huntsville had 92.2, Montgomery at 92.0 and Charlotte at 94.8.